Watching the blizzard rage outside today made me really in the mood for spring and summer and fresh produce. 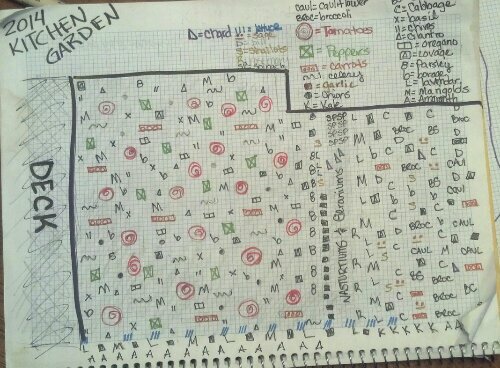 Rather than staring wistfully out the door, pining for the sunshine, I decided to draw up the plan for my 2014 kitchen garden. This is the garden that sits right outside my kitchen. It’s the one I can see whenever I’m sitting at the table, drinking my morning coffee. It’s the one I can look to for inspiration when I’m trying to decide what meals to make for the week. Here’s a close-up of the symbol key. *Note: Symbols are entirely made up and have nothing whatsoever to do with anything. On the side closest to the deck, we have the tomato support group that you may remember from previous post. On the other side will be the brassica support group. 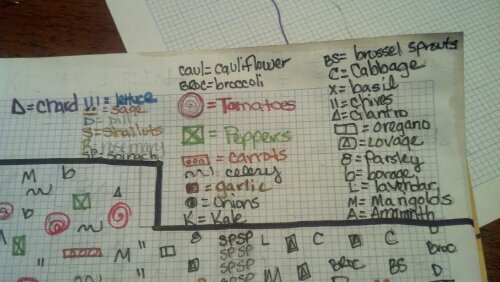 Each group shares companions: geraniums, nasturtiums, garlic, carrots, borage and lovage. These plants will be interspersed throughout each garden with the geraniums and nasturtiums, lovage and marigolds fencing in both beds. Each of these beds will be duplicated out in the pasture in our woody beds. We’ll have a brassica bed and a tomato bed along with all the beans and squash, okra and cucumbers, corn and ground cover that will also be out there.